How many deals will be sent? Maximum 3 deals per day. Working inline with whatsapp guidelines, we send not more than 3 deals everyday. What kind of Deals will be sent? Daily Deals of product price with offers. We may occasionally send some really good merchant sponsored deals. 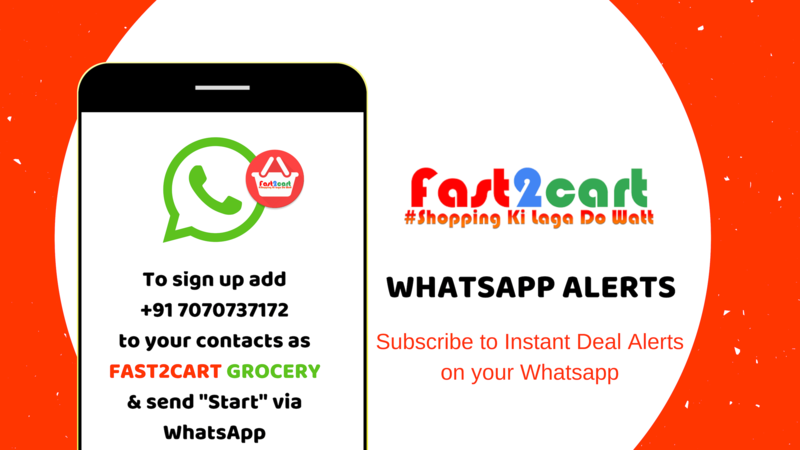 Will I be eligible for the weekly prize if I am already a Fast2cart whatsapp subscriber? Yes, the winner will be picked randomly from ALL whatsapp group subscribers. So make sure to subscribe to the whatsapp group. The winner will be notified by whatsapp and also our team will inform via call. How do I unsubscribe from the whatsapp deals ? We would love for you to stay. But should you wish to unsubscribe, just type ‘STOP’ and send it to the same Fast2cart Grocery number that you subscribed to and your number would be removed from the whatsapp messaging list. My friends want to subscribe too, can I share the same number?